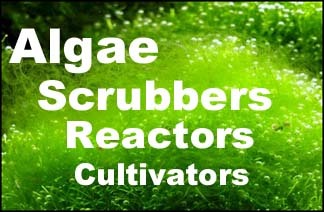 Ive been reading up on algae scrubbers for freshwater after a friend suggested it to me. I have most of it set up but need ro figure out lighting and if i need more flow/stronger air pump. The set up is as follows (freshwater) 300 gal dislay tank, 100 gal sump, filtered with bio and two dc pumps. The screen size is 15x8 roughed up with a hole saw. I have a cheap 60w red led bulb that i just recently found out is probably just a white led painted red bulb. Also have a 5w full spectrum grow bulb. Right now i have it set up with the 60 watt bulb for one day. Whats better for algae growth a red spectrum led or full sectrum ? Does it look like it has enough flow? FW grows really easy, so as long as the bubbles are rubbing the screen it should be ok.
A white-painted LED bulb is probably bad, but use it for now. A regular CFL 44 real watts is probably better, in "warm" or "soft" color, with reflector. Keep moisture off of them, however. Whats the duration i shoukd runnthe lights for ? Past two days its been on 24 hrs. 24 hours is ok to start, but you'll probably want 18 hours after it starts growing. Red is fine for algae.